How many different ways have you tried to keep your kids occupied on long car trips, plane trips or in the stroller? If you're anything like me, we've tried it all, trays with beanbag bottoms which - inevitably get dumped or everything rolls off from the edge. The jelly roll pan with magnetic tape on the bottom of everything so it stays put - clumsy and will eventually tip over when your kiddo moves around. Now there's a better way... Snack and Play. The Snack and Play features a firm surface so your kiddos can not only snack, but draw, do puzzles - you name it! It's great because the sides are raised so toys don't fall off the edge. 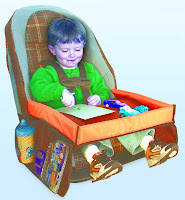 It straps onto your car seat, stroller, etc. so all of it's contents don't get dumped with your kiddos twists and turns. Plus, it has really great pouches on each side to hold coloring books, crayons, anything! The Snack and Play is one of those products that I wish was around when my kiddos were small - it would have been used nonstop. Snack and Play is available at both online and brick & mortar retailers, you can find a retailer near you here.